Animals used to be a big part of life here in Istria, where farming was a way of life for a long time. During childhood visits, I loved spending time on my grandparents' farm where there were cows, chickens, and pigs. But today few people keep farm animals. A few old ladies here in the village have chickens, while one family living just outside the village has sheep, goats, a pig, and a horse. But there are several dogs and cats. Many of our neighbours have dogs trained for truffle hunting, but unfortunately when they're not out in the forests searching for these rare (and expensive!) truffles, they're locked up because they're considered more valuable than other dogs. 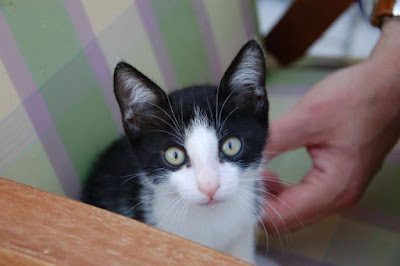 As for cats, they roam free and there are quite a few resident cats here in Gračišće, as well as a few strays. If you follow this blog, then you know that our cat Squeaky moved with us from India. And if you follow my Instagram page (or Squeaky's Instagram page!) then you'll also know that a kitten moved into our home recently. About two months ago, a little black and white kitten showed up on the courtyard wall and has been here ever since. Needless to say, Squeaky, who famously hates all other cats, is not very happy about this new development and has tried her best to chase this unwanted intruder away. Točka (meaning 'dot' or 'spot'), however, is very persistent and not easily deterred, and has since moved in and made herself very comfortable. Space is still being negotiated with Squeaky, who vacillates between total indifference and extreme opposition to Točka. Some days I think we're making progress, only to have to witness another screaming feline stand-off. I'm not sure where Točka came from... is she the offspring of Lola, a long-time resident stray? Or was she abandoned? Unfortunately, we've come across quite a few abandoned animals... Earlier this month, a cardboard box had been left in the loža just inside the village gateway with two eight-week-old kittens inside and their date of birth written on the box. I was surprised they were males, because it's usually the females people try to get rid of. My friend and neighbour M adopted one, introducing him to her cat Luna – who is also adjusting to the new addition to her household. 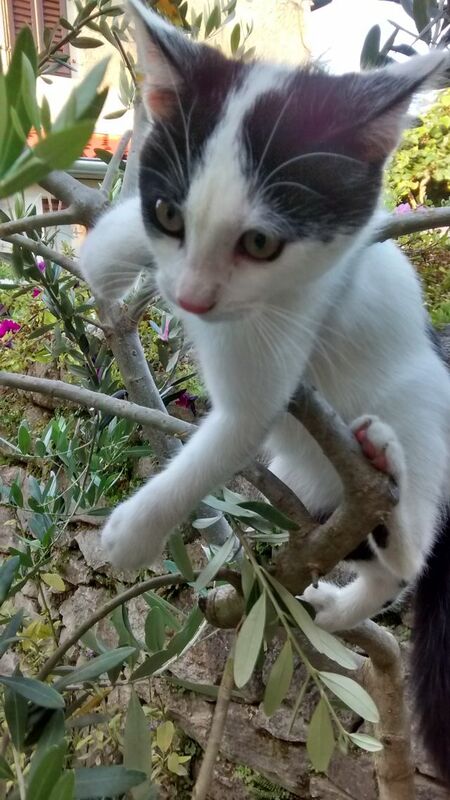 As for the other kitten, it seems to have disappeared, the sorry fate of many abandoned animals. In related news, just a week after the box of abandoned kittens incident, my neighbour L introduced me to a dog who suddenly turned up in the village. Another unwanted and abandoned pet? The dog quickly won L's affection: he was calm, quiet, and obedient, but had 'a certain sadness about him', L said. He had a slight limp, and spent a lot of time licking his paws. We deduced that his paws were sore because he had probably spent a long time walking. Otherwise, he looked healthy, clean and well cared for, and wore a nice collar. L took it off to see if anything was written on it – maybe a phone number... but found nothing. I suggested a trip to the vet to check for a microchip – someone had obviously taken good care of this dog and there was a good chance he may be micro-chipped. I was holding my breath while the vet scanned the back of the dog's neck, and was thrilled when the scanner registered a number. He disappeared into his office to look it up and came back with a printout of the dog's details. This is how we learned that his name was Bongor, and that he was three years old. 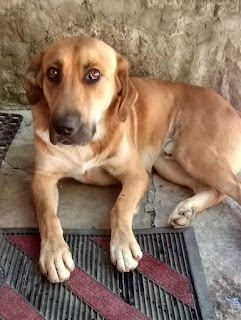 He had been microchipped only about ten days before, and his home was in Lovran on the east coast – 50 kilometres away by road! The most direct route overland covers half this distance but would involve crossing the Učka mountain and some very rugged terrain – is this how Bongor got to Gračišće? And is this why his paws were so sore? Why would he set out on such a journey so far from home? Or was he intentionally abandoned? Only Bongor knows the answers – but later that day he was on his way home with his owner and both seemed genuinely happy to be reunited. A happy end! Cats and Croatia... a familiar combination.